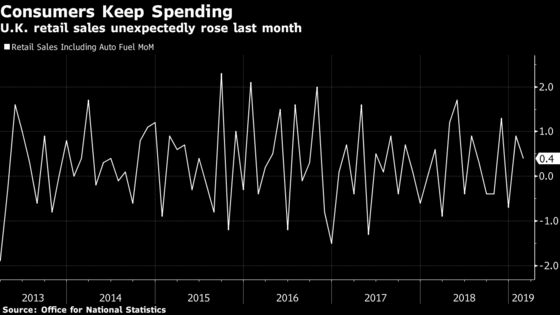 (Bloomberg) -- U.K. retail sales unexpectedly rose in February as growing incomes and one of the warmest winter months on record encouraged consumers to spend on everything from sporting equipment to garden furniture. The volume of goods sold in stores and online rose 0.4 percent from January, when they increased by 0.9 percent, the Office for National Statistics said Thursday. Sales excluding auto fuel gained 0.2 percent. Both measures were forecast to fall by 0.4 percent. The figures appear to contradict surveys that suggested Brexit uncertainty was making Britons reluctant to spend. The underlying picture for consumers has improved in recent months, with employment at a record high and wage growth now comfortably outpacing inflation. There was also good news on the public finances, as strong tax receipts and lower debt costs left the budget in virtual balance last month. Sales of food fell 1.2 percent as promotions seen in January came to an end. Non-food sales rose 0.9 percent, with every sector posting increases except for textiles, clothing and footwear. Overall sales were 4 percent higher than in February 2018. Sales in the latest three months rose 0.7 percent. Barring revisions, sales will provide a contribution to economic growth in the first quarter unless March sees a drop of 2.9 percent or more. Online sales accounted for 17.6 percent of the total last month after surging 9.4 percent over the past year, underlining the challenge facing retailers from Amazon and other e-commerce rivals. The budget deficit narrowed to just 200 million pounds ($263 million) in February. Revenue rose 3.6 percent and spending including capital investment increased 1.7 percent. Spending was boosted by a big increase in payments to the EU. The shortfall is on course to fall to its lowest in 17 years in the 2018-19 fiscal year, which ends this month. February brought record-breaking temperatures, boosting sales at sports stores, garden centers and second-hand shops, the ONS said. Officials lowered their budget-deficit forecasts last week, giving Chancellor Philip Hammond more money to make good on his pledge to end austerity -- providing a damaging no-deal Brexit is avoided. The Office for Budget Responsibility expects the 2018-19 deficit to fall to 22.8 billion pounds. That’s equal to 1.1 percent of GDP, down from almost 10 percent in the aftermath of the financial crisis. The shortfall was 23.1 billion pounds in the first 11 months, little more than half the level of a year earlier. Income tax, including self-assessment, has been especially strong. It has risen 7.1 percent so far, partly reflecting strong earnings growth at the top of the pay ladder. Value-added tax receipts gained 5.7 percent.